Generation C (Gen1) standard tight round liner. Complete with 3 needle count it is commonly used for complex detailing and lining. Original Generation C (Gen1) T-Tech needle cartridges have a patented design. Each 3 point tight round liner is fit with a standard twist lock cartridge mechanism, compatible with most tattoo machine grips. It securely locks the cartridge in place for safe tattooing. The standard round liner configurations are available with 3, 5. 7, 8, 9. and 14 needle points. 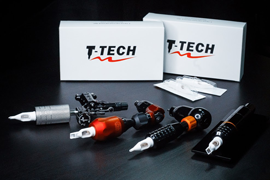 T-Tech tight round liners are configured in a perfectly round shape and are manufactured with super long tapers (6-7mm) to keep extra tightness between the needle points. Tight round liners are #12 (0.35mm) in diameter and are used primarily for lining, dot work, detailed work as well as larger needle counts are often utilized for shading small areas.